For years and years, swimmers from other nations — even if they didn’t want to admit it and would never say so in public — feared the mighty U.S. swim team. This 2015 world championships is only three days old, and there is plenty of racing to go, but one thing, more than anything, is already clear: the fear is gone. The rest of the world has for sure caught up to the United States. Indeed, swimmers from other countries have proven themselves better than the Americans, and in a number of disciplines, a dramatic trend that has emerged as the No. 1 story at Kazan 2015, and could hold significant consequence for next year’s Rio 2016 Olympics. On Monday, the U.S. went medal-less in three finals. On Tuesday, American swimmers came up empty in the men’s 200 freestyle — Ryan Lochte, fourth — and the women’s 100 backstroke — Missy Franklin, fifth, and Kathleen Baker, eighth. The Americans did salvage one non-Katie Ledecky medal — Matt Grevers’ third-place in the men’s 100 backstroke. Grevers had been the defending champion in the 100 back from Barcelona 2013 and the London 2012 Games. His bronze marked the first medal of the meet for U.S. men. 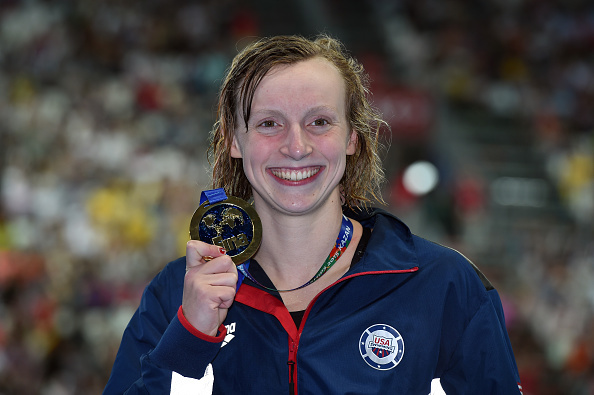 The 18-year-old Ledecky has stamped herself at these championships as the No. 1 swimmer in the world. Zero question. Every race is a chance at a world record. On Tuesday night, Ledecky demolished the world record in the 1500 free final that she herself had set in the prelims the day before. Tuesday: 15:25.48, 2.23 seconds faster. She won the race by more than 14 seconds over Lauren Boyle of New Zealand, 15:40.14. That made for her ninth world record — in the 1500, 800 or 400 — since 2013. Ninth! Ledecky’s stats verge on the outrageous. Her time Tuesday is a full 24-plus seconds under the qualifying mark for U.S. men for the 2016 Olympic Trials, 15:49.99. A Belgian journalist, Philippe Vande Weyer, who knows the Olympic scene well, said on his Twitter feed that Ledecky’s time Tuesday would have won the Belgian men’s championships by 52 seconds. Some 29 minutes after the 1500 final, Ledecky was back into the water for a punishing double, bidding to qualify for Wednesday night’s 200 free final. Eighth at 100, seventh at 150, she raced the last 50 meters hard, finishing third in her heat for the sixth-best time over the two semis, 1:56.76. Franklin advanced as well, with the second-best time, 1:56.37. Before the 200, she said, her “legs kind of felt like jello,” surprising because, as she said, “I barely kicked in the mile,” what swimmers call the 1500. The U.S. medal count after three days: four, two gold, two bronze. Ledecky has both golds: the 1500 and 400, which she won Sunday in setting a meet (but not world) record. The bronze medals: Grevers and the women’s 4x100 relay team. Great Britain and Australia lead the medals count, each with five. Britain’s emergence offers emphatic proof of how the world has changed. At the Barcelona 2013 worlds, the British won one medal, a bronze. You have to go back to 1986, and the days of Communism, to find a swim worlds in which the U.S. did not win the overall medal count. That year, the East Germans won, with 30; the Americans came in second, with 24. There is zero doubt that over the decades the U.S. has been the dominant power in world championships swimming. Coming into Kazan 2015, the U.S. had won the most medals (and by far), with 418; Australia had 152. Same goes for the gold-medal count: U.S. 231, Australia 58. The Americans’ real edge has come in world championship years the year before an Olympics. See, for instance, 2011 Shanghai (29 medals, 16 gold); 2007 Melbourne (36 medals, 20 gold, as Michael Phelps geared up for Beijing 2008); Barcelona 2003 (28 overall, 11 gold). Phelps is not in Kazan as part of the fallout from his drunk-driving case. — Seven world records have already been set at Kazan 2015, bettering the mark set by the end of Barcelona two years ago, where there were six. Ledecky has two; the rest of the world, five. — Before Tuesday, no female swimmer from New Zealand had ever won a gold or silver at the worlds in any event. Boyle and Zoe Baker had been the only women from New Zealand to win a worlds medal — bronze, five in all. Boyle’s silver in the 1500 made for a first. — In Tuesday morning’s prelims of the men’s 50 breaststroke, South Africa’s Cameron Van Der Burgh broke the world record. At night, Britain’s Adam Peaty — in the first of two semifinals — lowered it again, down to 26.42. American Kevin Cordes set an American record in the semis, 26.76. Peaty, in the next lane, went a full three-tenths faster over a mere 50 meters. Peaty, afterward: "The morning swim was easy, and I knew this was just the 50-meter race, not my main event," the 100, which he has already won here, "so I didn’t have any pressure. This made this semi also really easy for me." — The top three in the men’s 200 free: James Guy of Britain, 1:45.14; China’s Sun Yang, 1:45.20; Germany’s Paul Biedermann, 1:45.38. Guy’s victory not only denied Sun the chance for a four-peat: the 400 (which Sun won on Sunday), as well as the 800 and 1500, in which he is a strong favorite. The win also established Guy as one of the middle-distance favorites for 2016. He took second, behind Sun, on Sunday in the 400. For his part, Lochte’s fourth matched the fourths he registered in the 200 from Barcelona 2013 worlds as well as the London 2012 Olympics in the 200 free. He said afterward he just needed to train harder. — Grevers' third-place Tuesday, in 52.66, came in a tight race. He finished behind Mitchell Larkin of Australia, 52.40, and Camille Lacourt of France, 52.48. — Franklin is the gold medalist in the 100 back at London 2012 and Barcelona 2013 (as well as gold medalist in the 200 free two years ago). On Tuesday night’s in the 100 back, she managed 59.4, more than a second behind winner Emily Seebohm of Australia, 58.26. Second, another Australian, Madison Wilson. Third, Denmark’s Mie Oe Nielsen. Fourth, China’s Fu Yuanhui. — Here was the field for the women’s 100 breaststroke final: Italy, Japan, Jamaica, Russia, Lithuania, China, Sweden and Iceland. Jamaica! Iceland! Russia’s Yulia Efimova won the race, in 1:05.66, and Kazan Arena rocked hard a few minutes later as the crowd sang the national anthem. It’s well-known in swim circles that Efimova trained in Los Angeles, at USC. Iceland’s Hrafnhildur Luthersdottir trained in Florida, at Gainesville. This sort of thing has been going on for years and years, and it’s not going to change, nor should it — athletes from all over the world coming to the United States for opportunity. — Phelps isn’t here. He’s not only the best swimmer in U.S. history but had emerged in recent years as a genuine team leader. — The Americans have long had a disdain for non-Olympic events such as the 50 sprints (everything but free: fly, breast, back) and new events such as mixed relays. The conversation should be had, and soon, about whether that focus deserves intense review. Outside of Nathan Adrian, it’s hard to pick anyone in the U.S. sprint program who seems like a sure lock for a medal, men or women. — The U.S. team for Kazan 2015 was picked a year ago. There were athletes who raced at the recent Pan-American Games in Toronto who should have been here, and vice-versa. Such a selection policy deserves, again, review. — And, perhaps most of all, there’s the fear factor. Or, better, the lack of it. Tyler Clary, the 200 backstroke gold medalist from London 2012, finished 12th in the 200 fly semifinals Tuesday, an event in which one American — Tom Shields, eighth — qualified for the finals. For years, Phelps ruled the 200 fly. Now, until proven otherwise, le Clos is the man. The South African turned in a solid second-place effort in Tuesday’s semis, behind Hungarian veteran Laszlo Cheh. The next question — did swimmers from everywhere else no long fear the mighty Americans? BARCELONA -- With the passage of time, and granted it has only been five years, the magnitude of what Michael Phelps accomplished in Beijing in 2008 becomes ever more evident. He set out to win eight gold medals. Inside the howl of noise that was the Water Cube, he won eight gold medals. Records are of course made to be broken. But one wonders whether that 8-for-8 will ever seriously be tested. Missy Franklin had come to Barcelona with the idea of perhaps trying for eight golds. It takes nothing -- again, nothing -- away from her brilliance and sheer exuberance to say that she now, after winning the women's 200 freestyle Wednesday here at the Palau Sant Jordi can "only" win seven, assuming everything else here at the 2013 world championships breaks her way. The choice, after all, was completely hers. Franklin realized after a demanding double on Tuesday that her best chance at winning the 200 free Wednesday night was to scratch Wednesday out of the 50 backstroke. Math works like this -- you can't get to seven without getting first to three, and Franklin made it three-for-three Wednesday night in 1:54.81. More math: It was her first time ever under 1:55. More still: last year in London, Franklin missed out on a medal in the 200 free by one-hundredth of a second. Absolutely, missing out weighed on her. "That was really rough, not making the podium -- just for my team. I really wanted to be up there for them. It was a really tough swim. I learned a lot from it and I don't think I would be here now without that swim. And so to be here now, and to go 1:54 -- I'm so happy." Federica Pellegrini of Italy, the world record-holder in the event, took second in 1:55.14. Pellegrini, who has consistently had a knack for the peculiar, disclosed after the race that she had trained for these championships solely by swimming backstroke and that her coach had convinced her only at the last moment to do freestyle. Camille Muffat of France took third, in 1:55.72. It must be remembered that Franklin just turned 18 in May. She will enroll at Cal-Berkeley after these championships. Last year in London -- even with the near miss in the 200 free -- she won four golds and a bronze. The victory Wednesday lifts her career world championship gold total to six. She won three in Shanghai in 2011. Here in Barcelona she took part in the winning 4x100 free relay on Sunday; she won the 100 backstroke on Tuesday. In an era when so many sports figures can be such downers, Missy Franklin is the complete opposite. She is relentlessly optimistic, hard-working, the ultimate team-player -- pretty much everything you'd want if you were saying, who would I want my middle-school son or daughter to model themselves after? This is why longtime observers of the swim scene such as Rowdy Gaines, himself a 1984 swim gold medalist, can hardly contain themselves when it comes to Missy Franklin. Now an NBC analyst, Gaines has heard it all, seen it all. Three times after her 200 free victory, he posted exclamation-point laden tributes to her on his Twitter feed. The last: "I can't help myself….Missy!!!!!!!!!!!!!!!" It is an article of nearly religious faith among elite-level swimmers that swimming hurts. That's because, sincerely, it does. Most come into an interview and proclaim, ohmigosh, that swim hurt so bad. Missy Franklin never says that. "That's the hard part about a 200 -- it's when you really start to feel it. You have another 100 left. So you have to stay mentally tough. That's when you have to focus on your own swim. And as soon as you touch that wall, all that pain goes away because you know you tried your best, regardless of what the time is." Franklin's strategy Wednesday was elegantly simple. The framework of the race, she said, was to stay even with Muffat in the first 100, then keep ahead in the final 100 of Pellegrini. Even so, she said, the only sure path to victory was to swim her own race: "A lot of it was mental .. just being able to concentrate on my own race and not getting caught up in what other swimmers around me were doing." Having learned from last year's near-miss, she and coach Todd Schmitz had focused on pace work. That, she said, paid off. And, she said, after a demanding double on Tuesday -- winning the 100 back, then swimming the semis of the 200 free -- it all seemed maybe just a little too much of a push, particularly after Wednesday morning's prelims, in which she finished 13th of the 16 qualifiers in the 50 back, at 28.44, nearly a full second behind the fastest qualifier, China's Fu Yuanhui, 27.55. The semis of the 50 back went down literally just minutes before the final of the 200 free. Franklin had won a bronze in the 50 back in Shanghai. If Franklin was perhaps a contender in the 50 back, she is so much more a favorite in the 100 free and the 200 back. The 100 free heats get underway on Thursday; the 200 back heats on Friday. There are two more relays to come as well. Asked at a news conference Wednesday whether it occurred to her just how "amazing" it was Phelps had gone 8-for-8, Franklin, as ever, laughed, and said, "Of course. I don't even need to do that [myself] to realize how amazing that was. "Just swimming seven events, eight events, six events -- I mean, swimming that was incredible, let alone winning every single one of them. Not enough can be said about what Michael did in 2008. It was absolutely incredible and, you know, watching him become the most decorated Olympian of all time in London was also an unbelievable achievement. "To be there to witness it was wonderful." To win five medals in London -- that was pretty special, too, especially for a teenager. And three golds already in Barcelona, with more very likely to come -- someone alert Rowdy Gaines, because he is going to need more exclamation points before this week is done.